One or more of the preceding sentences incorporates text from a publication now in the public domain: Hanna, Edward (1911). 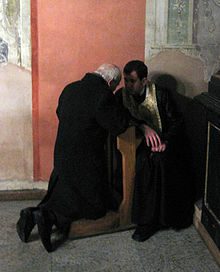 "The Sacrament of Penance" . In Herbermann, Charles. Catholic Encyclopedia. 11. New York: Robert Appleton. One or more of the preceding sentences incorporates text from a publication now in the public domain: Leclercq, Henri (1910). "Fourth Lateran Council (1215)" . In Herbermann, Charles. Catholic Encyclopedia. 9. New York: Robert Appleton.